Sometimes, the story of a restaurant isn’t about the good food you’ve enjoyed — it’s about how you never got to sample the fare because the place went toes up before you ever got a chance to visit. The restaurant business is a notoriously difficult one, particularly for stand-alone start-ups. Statistics show that more than half of newly established restaurants will be out of business within three years. The most common reasons for failure, according to the experts, are lack of sufficient cash flow and capitalization, a concept that doesn’t work, a bad location, and poor quality food. In our little section of downtown Columbus, we’ve seen several restaurants close their doors recently. Stack’d is one that I never got a chance to try. Located at the corner of Third Street and Lynn Alley about a block from our firm, Stack’d billed itself as “The Flavor Architects” and offered a diverse menu of sandwiches, salads, pizzas, chips, and smoothies. It was open for a few months, then posted a sign saying that management had gone south for the winter, then a sign that the restaurant could be rented for training, and finally the “for sale” sign that is there now. Why did Stack’d fail? Who knows? The only word-of-mouth I heard about Stack’d when it was open, from one person, was that the food was good but the ordering process was complicated and patrons had a lot of decisions to make. The story was different for another restaurant that closed recently. The Carvery, located directly across Gay Street from the firm, offered sandwiches and soups that were very good. It seemed to do a thriving business and was always bustling when I was there. But then it apparently experienced some kind of significant plumbing problem, posted a sign that it was temporarily closed — and never reopened. 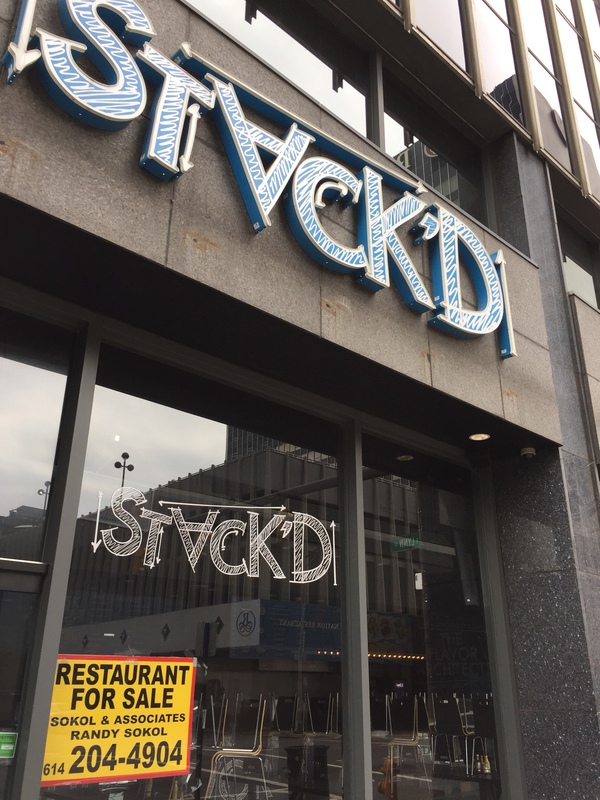 We’ve heard that another restaurant will be opening at The Carvery’s former location, and I’d expect some other food-loving entrepreneur will eventually take a stab at opening up where Stack’d used to operate. I wish them good luck, and hope they stay open long enough for me to visit. Gay Street is home to more restaurants per square foot than any other street in downtown Columbus. Yesterday JV, the Unkempt Guy, the Bus-Riding Conservative and I paid a visit to the newest member of the Gay Street Foodiehood, an Irish/American joint called Pub Mahone that opened only a few months ago. It wasn’t a hard choice on a day where rain was in the offing, because Pub Mahone is only a few steps down the street from our office and we were feeling in a neighborly spirit, besides. Why do you go to an Irish pub? (Well, to have an adult beverage or two, of course, but I wasn’t thinking about that because we were there for lunch.) In part, it’s the atmosphere. You’re looking for a place that is warm and snug, with dark wood walls, wooden tables, a wooden bar, and as many other wood elements you can reasonably cram into a restaurant space. Pub Mahone delivers on the ambiance front. It’s got wood everywhere you look, with the customary pictures and other Irish features, including a mock-up of what appears to be a thatched roof house. It looks like it would be a great place to gather after work with friends. The food is pretty good, too. I went for the American side of the menu and had a double Sibin burger with fries; the rest of the lunch group decided to go Irish. The UG and the BRC had the Boxty Mahone, which our fun and feisty waitress aptly described as a “big pile of food” with cabbage and corned beef on potato cakes, drizzled with Mahone sauce. I noticed that neither the UG or the BRC left anything on their plates. JV went for the Reuben Mahone, which was enormous and also featured some very tasty-looking corned beef. In fact, the corned beef looked so good it made me briefly second-guess my burger choice, but after a few bites of the double Sibin I realized I also had made a wise decision. 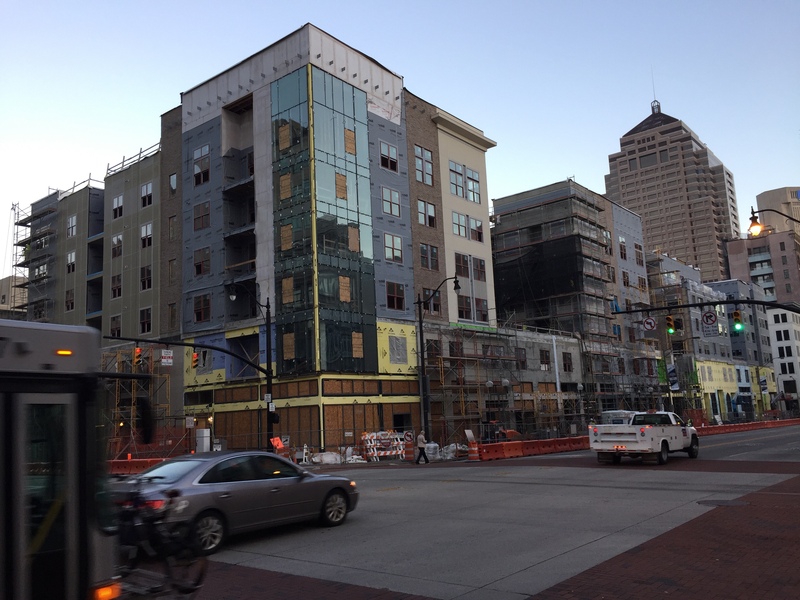 With Pub Mahone, we’re really starting to cover the food option bases on Gay Street. What’s next? The lunch crew is ready for just about anything. I was walking through the Columbus airport on may way back from Denver last night when I passed a painted wall map depicting some of the different cool spots in Columbus. 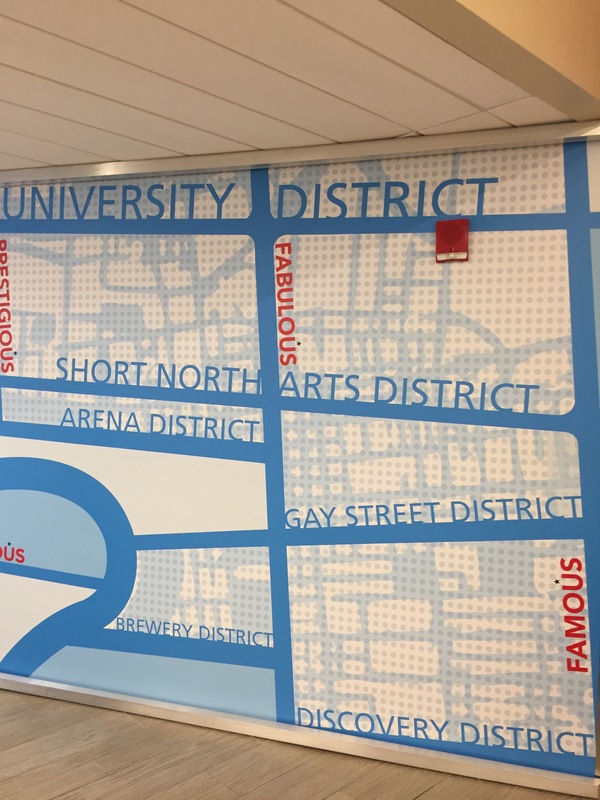 There was the Short North, of course, and the Arena District, and the Brewery District, and the University District, and the Discovery District, and the Gay Street District. Wait a second — the Gay Street District? Well, if a painted wall on the airport says it, it must be so. Good old Gay Street is now officially a “district,” right up there with the other established hot spots in Cbus. If you’re a “district,” you know you’ve arrived. Gay Street deserves to be a “district,” too. It’s easily the coolest street in the core area of downtown Columbus, and it’s getting cooler by the minute. With the recent addition of the Buckeye Bourbon House, the opening this week of Tiger + Lily, an Asian fusion restaurant, and the forthcoming opening of an Irish pub just across the alley, Gay Street offers a wide range of food and liquor options — and there is even more coming, with the Veritas Tavern set to open next year in the Citizens Building at the corner of Gay and High Street. The street is bustling from noon onward, and it really shines during the spring and summer months, when the outdoor dining venues like Plantain Cafe, the Tip Top, and Due Amici all seem to be filled to overflowing when the workday ends and the fun begins. For those of us who worked on Gay Street in the early ’90s, when the area was a kind of ghost town after 5 p.m., the transformation to the Gay Street of the modern day has been both exciting and amazing. And I like to think that our firm, Vorys, Sater, Seymour and Pease LLP — which has remained in its offices on Gay Street through thick and thin — helped to make that transformation happen with its large array of hungry and thirsty lawyers, paralegals, and staff helping to fill up the coffee houses, restaurants and taverns that now call Gay Street home. “The Gay Street District.” Yep, I like the sound of that.